GREE Electronics is a globally leading enterprise of air-conditioners. Its high-quality products are distributed in the Pakistan market by the DWP Group. 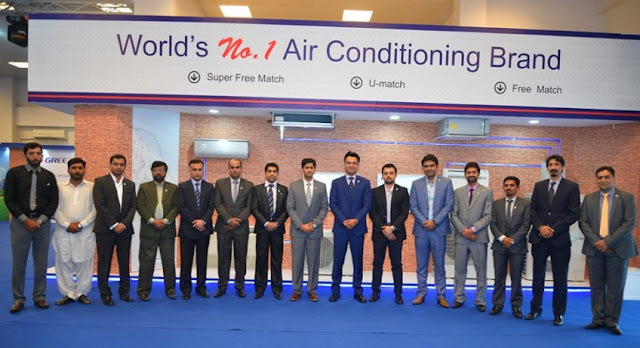 This innovative technology leader is among the key participants at the 24th International HVACR Exhibition, held from 30th March – 2nd April 2017, at the Expo Center Johar Town Lahore. Gree has been consistently innovating new technologies to create the best-suited products, in accordance with the experts’ insights and the changing needs of the consumers. At this Expo, Gree’s exhibition area was the largest and demonstrated a wide range of heavy and light, commercial and residential units. Representatives of gree team were available for on spot queries and demonstration of both commercial and residential air conditioners. Gree Electronics is the top rated global enterprise, having 9 production plants all over the world and catering their products to 195 countries. DWP is the official brand partner of Gree in Pakistan. Both Gree’s marketing and technical support team actively participated at the Expo. Being the pioneering innovator in air conditioning technology – Gree is committed, never to compromise on the quality of its components.